The only constant is change, propounded the Greek Philosopher ‘Heraclitus‘. 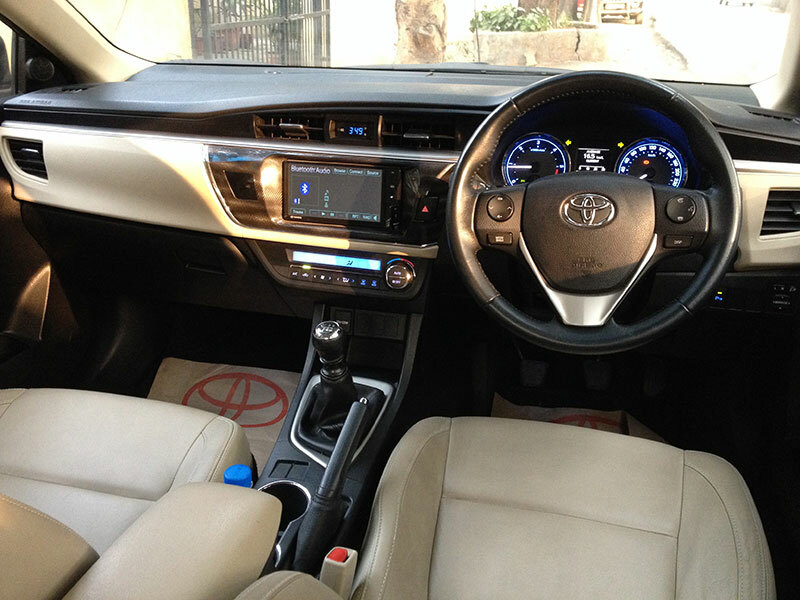 Toyota, the world automotive giant, has read and heard the critics long enough to acknowledge that whilst the Corolla is all car to most people, it has always lacked visual flair and appeal despite its brilliance as an efficient, low maintenance and reliable everyday car for the common man/woman. The current generation Corolla answers some of those critics by jettisoning its conservative design philosophy for a fairly dramatic and fresh external body design change through use of sharper lines, creases and angular sheet metal use. The model here reviewed is the top specified 1.4 litre turbo-diesel 6-speed manual ‘GL’ trim and the following is a weekend impression of the car. 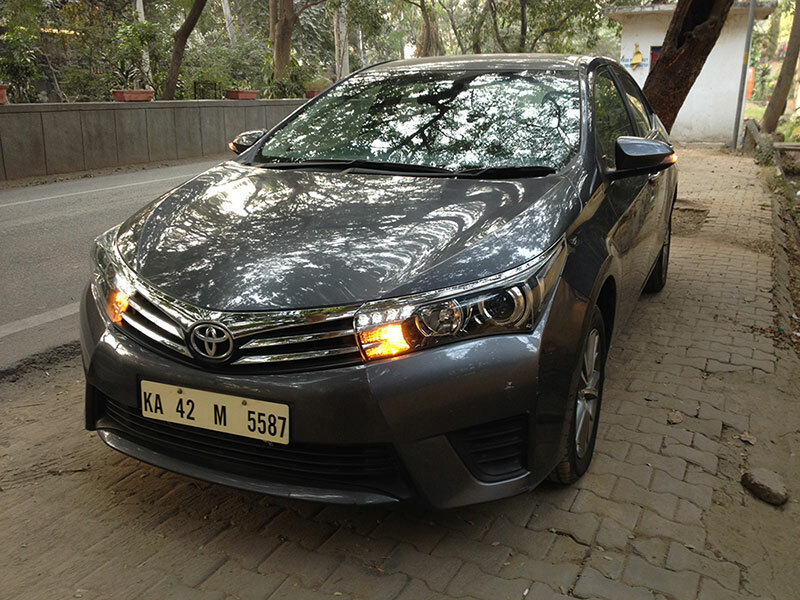 In the top specified GL version, the new external design on the Corolla looks quite distinctive and attractive with the right amount of chrome, smart 16′ factory-fitted alloys riding on 205/55 Yokohamas and LEDs lights front and rear give it the contemporary jewelled effect and a more aggressive look. 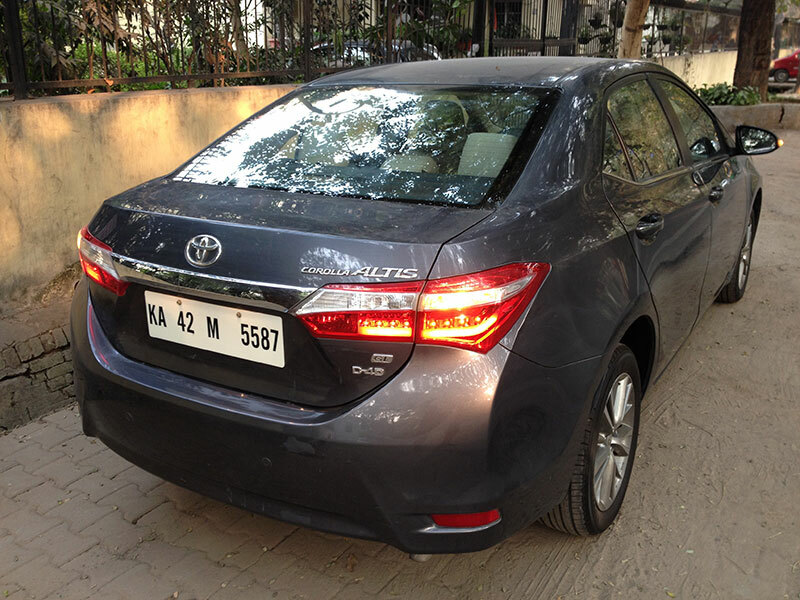 Interestingly the current Corolla has been given a different front and rear light and bumper design for the US market, which in my opinion would have worked well in India as well, though with a bit more chrome to satisfy our discerning taste. Otherwise, the Corolla feels fairly robust in build and all mechanical and electrical tasks execute efficiently and assuredly. The cabin interiors of the Corolla in the GL trim is again contemporary and feels adequately upmarket for the class, with use of leather for the seats and doors mixed with dark plastics, which loses the faux wood inserts for the dashboard, only to be replaced by faux carbonfibre plastic inserts, one does feel that the plastics do however need further refinement to justify the price tag this model comes with. The interiors are otherwise airy and provide the occupants good all round visibility. A stand out feature for me is the extremely spacious rear passenger room for three adults through the increase in wheelbase (2700 mm) and use of comfortable leather seats, good news for buyers using chauffeurs, though a noticeable omission are rear air-con vents. The boot space is quite large (470 litres), which increases further with drop-down rear seats, and the cabin is littered with storage for bottles, cup holders etc. Further, in the GL, just about everything is electrically run for ease of use, which includes to name a few, push-button start/stop, driver seat adjustment, power door mirrors and windows, remote boot release, electronic climate control for a powerful air-con system and a multi-functional steering wheel with audio and phone controls for the easy-to-use multi-functional infotainment system with good sound through 6 speakers, keyless entry and start. 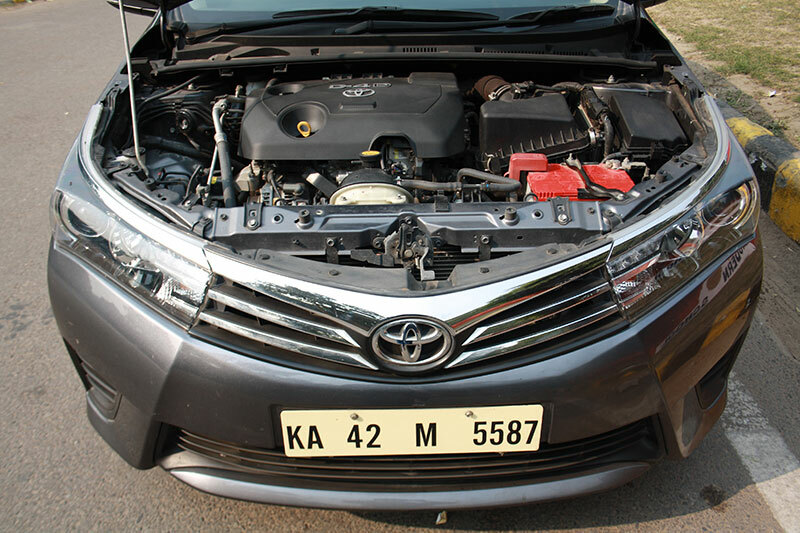 Toyota has carried over the 1.364 litre D-4D turbo-diesel engine from the previous generation and power output has remained at approximately 89 bhp with maximum torque at 205Nm between 1800-2800 rpm. 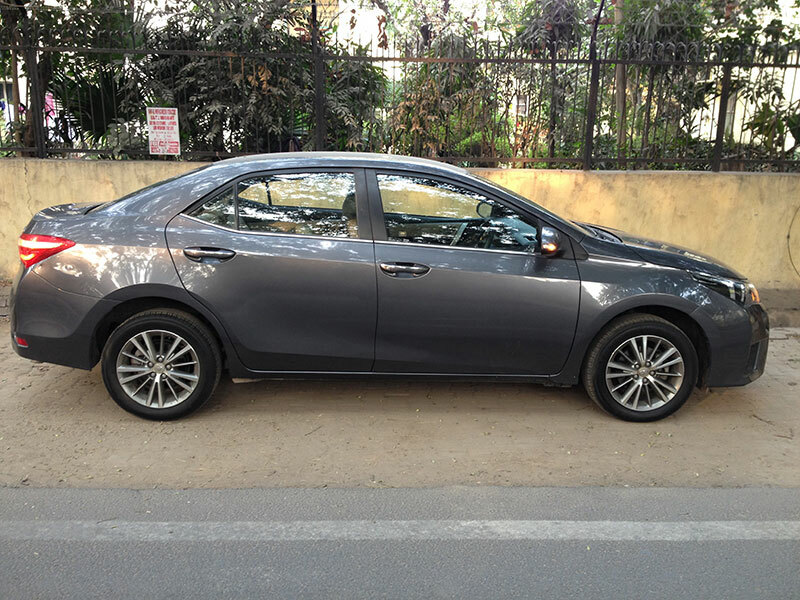 The Corolla weighs in at a shade under 1300 kgs and consequential power to weight ratio is alarmingly low, especially from a price point of view. Below 1500 rpm in any gear, the Corolla will frustrate an eager driver, but go past that mark, the pace picks up in a linear and predictable manner for smooth progression and your reason tells you that the car has been purchased for fuel returns and not an unwise heavy foot. The engine note is also quite noticeable inside the cabin at low revs but fairly drowns out with pace, though surprisingly the sound of poor broken roads and tire roar does seem to seep through. However, though lacking in outright power, in real world conditions it inexplicably still feels just adequate and even provides just enough roll on acceleration for going past slow moving objects and overtaking, however the operative words being just adequate and just enough. Despite the small capacity and low winter temperatures, the engine also fires into life without a moment’s hesitation and is on the ball immediately, through a fairly slick 6-speed manual gearbox and easy clutch, mated to Toyota smooth and efficient drive train and transmission. 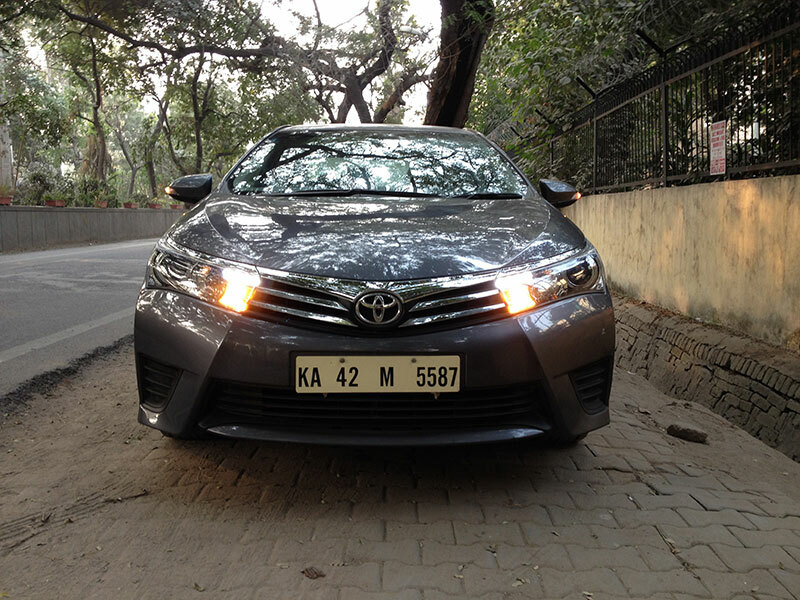 The diesel Corolla Altis has not been built for speed or for the enthusiast nor does it claim to wear that hat. Yet when called into action it is predictable and confident, the electric power steering is direct and good to hold and the car stays composed at reasonable speeds, the disc brakes on all four wheels are effective and brake pedal action is confident inspiring. The large glass area and cabin design also help provide the driver a good 360 degree lookout for hazards. The front passenger and driver get airbags and the car comes with ABS, EBD and brake assist on all diesel variants. To assist with parking, the Corolla also comes with rear parking sensors with a reversing camera that displays itself in the infotainment system with grid marks and proximity tones. On a combined cycle of city and some highway driving, and the occasional heavy foot, the Corolla returned me an average of 16.5 km/l, which with a 50 litre diesel fuel tank capacity, smooth drive train and comfortable cabin, provides the occupants a relaxed long distance cruiser with an engineering reassurance that Japanese cars in general, and Toyota in particular, have built their unparalled reputation on. 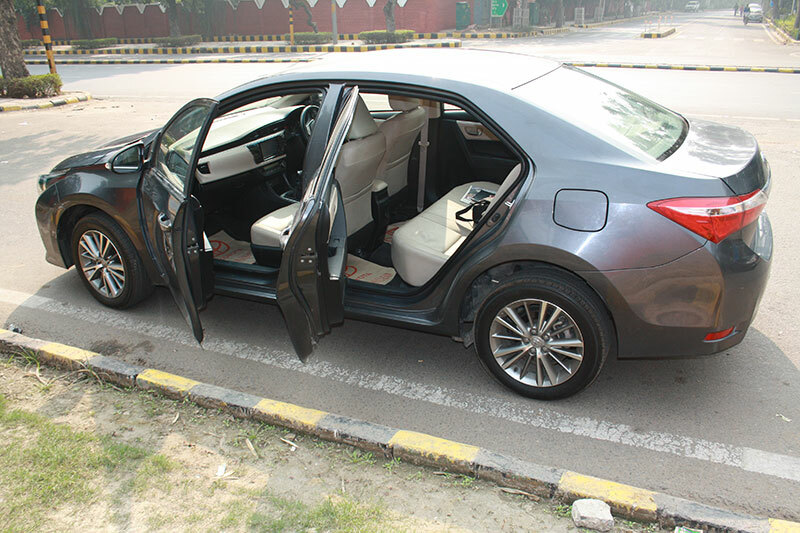 The diesel Toyota Corolla Altis starts at a shade under Rs.14 lacs (ex-showroom Delhi) and top specified ‘GL’ reviewed here tops out at approximately Rs.15.5 lacs (ex-showroom Delhi). For this price, the Altis has plenty to compete with, and that too across segments including from the in-demand entry level SUV options. To broaden its appeal further and beyond just dramatic changes to its skin, the Corolla needs higher power output numbers for the money involved, even if the same can only be achieved by sacrificing some fuel returns. Such a strategy I am sure many will reconcile themselves to without a nostalgic sigh, for the very fact that it is a Toyota and a Corolla, it will always have plenty to shout about, not least of which is legendary reliability, efficiency and hassle free ownership experience. This when paired with diesel frugality and firm resale values, as a potential buy, the Corolla Altis will always remain a worthy choice.